What is the soul of any knife? What defines a blade as a knife? Sure, boxcutters do many knife related tasks, but are they knives or simply edged tools? I would argue that the importance of any knife style and design lies in its heart and soul. The steel. Hello, my name is William Woods and I am a knife maker . . . Since The Truth About Knives is just taking its first steps this week, Chris Dumm and I thought we would start things off properly and start a discussion about blade steel. Now enough of the introductions: let’s talk blades! The single most asked question is always, “What is the best steel for a knife?” Well, like all simple questions the answer is far from direct and concise. Choosing the steel that fits your needs is kind of like picking a car. Can you tow a horse trailer with a Porsche? Sure. Will it perform terribly and eventually fail? Yes, yes it will. The most common complaint that leads many to bad-mouth a certain alloy of steel is to try and force one type of knife to perform tasks it is ill suited to. Three things determine the “performance” of any cutting blade. Blade geometry (the style and shape of a knife), alloy (the particular mix of steel), and the heat treatment (the process used to harden the alloy). In this article we will be discussing steel alloys and their performance characteristics. OK, so the big first distinction most people are familiar with are “stainless” and “carbon” steel. These are slight misnomers, considering that stainless steel is only stain “resistant” and ALL steel has carbon in it. [Ed: if it didn’t, it wouldn’t be steel.] Semantics aside, it is generally accepted that to be considered “stainless” a steel alloy must contain 13% chromium. Now here is where it gets complicated. There are hundreds of steel alloys that are suitable for making knife blades and the individual composition of those alloys mean they can contain anywhere from 0% to 25% chromium. Great, let’s add a bunch of chromium and make the most super-duper stainless blade ever! Right? Hold on: unfortunately metallurgy is insanely complex, and the more chromium you add the worse the steel gets at important things like staying sharp and cutting things. The point is that blade steel metallurgy is a delicate balancing act. Every alloy is made to balance corrosion resistance, edge holding, machining, wear resistance, and toughness. There is no magical unicorn horn steel that can live in salt water, slice paper all day, and cut down trees in its down time. It doesn’t exist. Since we are talking about corrosion, let’s say you asked me for recommendations of corrosion resistant steels. I would say the most popular and highest performing stainless steels on the market today are 440C, CPM-S30V, 154-CM, 12C27, AUS-8. In no particular order these stainless steels offer superior stain fighting powers and will hold an edge if properly maintained. So we have covered what puts the “stainless” in stainless steel. Let’s talk toughness. Toughness is a very particular metric. Specifically it means the ability of a material to absorb energy and plastically deform without fracturing. Knives that break are blades that have been pushed beyond the limit of that alloy’s (and heat treatment) capability. Many many elements contribute to the toughness of an alloy but commonly manganese, molybdenum, nickel, and silicon are used to control the hardness/toughness of an alloy. Toughness is typically a one way street. The tougher the steel the worse is holds an edge and vice versa. Typically really tough knives made for extreme tasks like chopping, prying, and hammering are made with equally suited alloys. Some are very simple like the good ol KA-BAR. KA-BAR’s are made with 1095 steel which is essentially iron, .95% carbon, and .4% manganese. Tough, holds an edge, re-sharpens easily. All the things you want in a combat/survival blade. Like all things though technology has advanced the metallurgy field and more companies are releasing “super steels” with complex compositions and precise heat treating specs. The king of the hill these days for tough steel alloys is probably CPM-3V. It’s expensive, semi-stainless (only 7.5% chromium), and practically bomb proof. I’ve personally cut dozens of card board boxes and then chopped down a 8” tree trunk into kindling and still been able to shave my arm. Amazing stuff, but leave it in a hunting bag in the back of a truck for a few hot and humid Georgia summer days and hello pitted rust! It is just not designed to resist moisture without constant oiling and maintenance. Here is the most subjective part of any blade steel. Wear resistance or edge holding is difficult to measure as a metric. Most end users measure the time it takes for a knife to go dull. This can be misleading since on a microscopic level there are at least 4 different types of edge failure but that is a different topic for a different day. The old stand by tests of slicing paper and shaving hair are reasonably good metrics for testing sharpness so let’s stick with those. Most blade steel alloys hardness is measured on the Rockwell C scale (from now on referred to as the RC). Most knives will register anywhere from 54-65 RC depending on alloy and heat treatment. Wear resistance refers to a blade’s edge holding capabilities. Some alloys can support finer thinner edges and will cut more easily. Some alloys take a “toothy” edge and consequently have nano-serrations that make excellent slicers but are poor for push cutting. So what chemically is making these alloys so hard? Well principally adding carbon increases wear resistance but vanadium and tungsten are commonly added to boost wear resistance. The basic principle is the formation of carbides during the heat treatment process to increase the hardenability. So you can see getting a knife to be sharp and stay sharp is really a balance of the ability to take an edge and the strength to hold it. This is where the industry has really gone crazy in the last 20 years. Since higher and higher RC hardness steels have always been possible the issue was toughness. There is little use for a sharp brittle knife. Kershaw, Spyderco, and Benchmade have all been selling these super steels that boast never ending sharpness. ZDP-189, CPM-M4, S110V, and the current champ REX 121 (with an insane RC of 72) are all extremely hard steels that will outlast a more pedestrian alloy by 3 or 4 times before sharpening. When customers are shopping for knives there usually is a limit. What’s the best knife for under $25/50/100/500? Well the moment you step outside the boundaries of “standard” industry steel and start shopping for more performance oriented alloys the prices start to rise. As a knife maker when I buy steel in bulk I pay by the pound. By weight a more common “mid range” stainless steel like 440C will cost 3-4X less than a more exotic alloy like CPM S30V. Add in the extra costs associated with machining, grinding, and heat treating exotic steels and you have a much more expensive knife. It all comes down to perceived value. Is it worth it to you? Do you need a Spyderco Endura 4 with a ZDP-189 blade for $170 or would the VG-10 version for $100 be more than enough? These are questions every collector or enthusiast must make for themselves. I can say definitively though that when you have a knife you truly love in a steel that performs just as well you have something special. It is an intangible feeling of having the pinnacle of what science and design are capable of doing together in one package. There are very few areas in our lives where we can honestly attain the absolute “best”. I will never be able to afford a Ferrari. I will never own an island or date a super model, or even own the finest 1911 man could want. But I can for $7-800 own one of the planet’s best knives, an elite group of people. That is the attraction of exotic super steels. Now for every “What is the best _?” question comes “Hey check out my knife! I got it on Ebay / China / Pakistan / truck stop / flea market!” This is the moment when your unknowledgeable friend will attempt to impress you with their newly acquired stabbing implement. Hey, we were all 11 years old once so try and let them down easily. Unfortunately, cheap and downright dangerous knock-off knives have been flooding the market for decades. The majority of which are made in China, Pakistan, or Indonesia. Now I will not say that a cheap import knife can’t cut well. I have been surprised 2 or 3 times in my life by a cheap Chinese knife. I have also been wildly unimpressed by HUNDREDS of crappy import knives. Many of these designs are so alluring because they 100% rip off designs from actual makers and manufacturers. (Anybody who collects Extrema Ratio or Rick Hinderer knives feels my pain) In many cases there are more fakes floating around than actual original knives, leading to some serious confusion. “China pot steel” and “Pakistani car bumper” knives are also quite dangerous. Folding knife locks fail, blades snap, and they go dull faster than a knife fight in a phone booth. Honestly good knives can be had starting at $20. There is no reason to start diving in the “Bucket O’ Knives” at your local gas station. We started this discussion by examining the question, “What is the best steel for a knife?” As you can see that is quite the loaded question. The only way to answer it is to ask some questions. What performance do you want from the knife? Will this knife be exposed to moisture? Will you be performing hard use tasks with the knife? What is your budget? These are some of the relevant questions that must be answered before a responsible answer can be made. Well thanks for listening to me ramble on about steel. I hope you learned something or at the least weren’t terribly bored. I hope to post more of these articles in the future. If you want more please let us know in the comments. I will do my best to answer any questions you have in the comments as well. Thanks William. I am a noob on the metallurgy front. I am looking forward to learning from someone who makes a living in the field. Well I don’t know about “Master”. We are all constantly learning and there are always more knowledgeable and experienced makers out there. I am glad I have been able to learn from my mentors and pass on what little knowledge I have retained over the years. Thanks for the post. I learned enough to have some idea of what I don’t know. Fantastic post, I really enjoyed it. I think I’ve found another site to visit constantly. So what is your opinion of the San Mai 3 blades? I know nothing about blades. San Mai steel is three layers forge welded together. Usually the outer two layers are a stainless softer steel and the inner layer is a harder tool steel. San Mai is fantastic when made properly. You really get the best of both worlds. Unfortunately it’s wicked expensive. So my urge to get a cold steel tanto in san mai is not a mistake. Very nice write up. I worked as a heat treater in my youth (25+years ago). At that time, we had about 30-4″ binders with alloy specs, can only imagine it would be double that today. Current edc uses 8Cr14MoV. I know it’s a Chinese steel, but been very impressed so far. Did I just get a “good one”? Good article. I often find that VG-10 is everything I want in a steel. Good corrosion resistance, gets really sharp, keeps an edge well (going on 3 weeks without sharpening), and fairly cheap. Yeah VG-10 is a great steel. I almost feel like it’s hard to screw up sharpening VG-10. It takes a mirror polish very fast and stays sharp for a quite a while. But lately I’ve been keeping my Spyderco Paramilitary 2 on me. The CPM-S30V does stand up a lot longer. I’ve gone months without sharpening it and it’s still really sharp. Now I don’t put it through a lot of hard use but cutting through plastic packaging and cardboard does take it’s toll on an edge. This blade keeps on cutting though. Guys VG 10 is way over-rated My SOG went dull in no time as well I bought a Delica with the same steel , same results .Then a month or so ago I decided to waste 20 bucks and bought a Ganzo ( Chinese junk they say ) it’s held an edge better than both the other knives & cost peanuts .Same tasks were performed , So is there a lot more marketing hype than truth & the most important thing is the heat treatment , that our Chinese friends are starting to get right .I still like the Benchmades but their pricing is starting to annoy me . I recently purchased a cold steel trailmaster in vg1 san mai I don’t know a lot about that steel other than it vg1 core and 420 jacket. Is this a good steel or is it a gimmicky type steel that cs gets accused of a lot.when I say good I mean edge holding ability, toughness and all the basic quality of a good knife steel. Your professional opinion would be greatly appreciated. Great article Will, very informative for someone who only has the barest clue in metallurgy. I have a question though, is there any way I can verify a blade’s steel short of taking it to a spectrometer? I bought a handmade fixed blade knife from a gun showe months ago, and its pretty well put together. The thing is, the guy who sold it to me (I will presume he was the maker, he spoke like he was) said it was made from D2 tool steel. So far I can tell that it is certainly harder and retains an edge better (and is a bit harder to sharpen) than my 440C and 440A knives (haven’t compared it to my 1095 nives). Any way I can verify this is actually D2? I mean I love the knife, but it would be nice to know for sure. Unfortunately it is quite difficult to authenticate different alloys of steel especially if they are similar in chromium content. D2 is classified as a semi-stainless because of its 11.5% chromium content. Theoretically your 440C blades with 17% should be more corrosion resistant BUT in the real world the quality of finish can determine resistance. A perfect mirror polished D2 MAY out perform a bead blasted satin 440C knife. Either way D2 will be significantly harder and hold an edge longer. Thanks for the responses, yeah I figured that might be the case. Oh well, I still love the knife either way. Also, just out of curiosity, would you care to speculate as to why we haven’t been able to recreate legit Damascus steel? Also, how do you think/theorize they made it back in the day? I’ve just heard some of the myths about Damascus steel and I was curious what an expert thought. I purposely left all pattern welded steels out of this article for reasons of clarity. Frankly I feel I could write a book on the origins of Damascus/Wootz steel. It has been a fascination of mine for several years now. I will be sure to write up an article soon on the subject. Thnaks for the responses. Yeah, Damascus steel is one of those fascinating lost art. Until we do know for sure though, I’ll cling to my theory of siren’s tears and dragon’s blood being used in the hardening process to create the carbon nanotubes 😉 Oh and if you ever do write that book, I will be one of the first people in line to read it. William (do you ever go by Will?) – my thinking is that a big advantage of common types of steel over exotic ones is they are predictable in how they will handle stress and wear especially over time. The maintenance and use curves are already established and one already knows what he is getting. I think the fact that iron based alloys are almost exlusively used is due (in part) to the fact that steel is more well known in terms of how to forge, handle, maintain, etc. Working with bronze, titanium, etc. is not as well known and the tooling for it is not as readily available. Sure call me Will! Even exotic alloys like REX 121 or Inconel are not typically designed for the consumer knife market from the ground up. Many are designed as tooling steels for very specific industry use. Crucible Industries for example pioneered the CPM process and the resulting alloys are so extremely thoroughly tested that there are no surprises. If properly heat treated exotic alloys will perform very consistently. Frankly because of their cost and the fact that only smaller sized runs are produced the quality control checks are higher than common cutlery steel like 420/440A/B/C. Most cutlery is iron/steel based because of hardness. Very very very few alloys can achieve the balance of hardness/toughness needed to make a usable knife. Titanium won’t harden enough, nickle can hold an edge, straight iron rusts, the more exotic metal elements are either too rare/expensive or extremely hazardous to our health. Ceramic is the only other widely used knife material and in my opinion waaaay to brittle for any duties outside the kitchen. Your right about tooling though. Machining titanium or Inconel is a religious experience. Many of the non-ferrous material work harden the moment and force or heat is applied making manufacturing expensive and time consuming. Very high praise! Thank you. Loved the article!! Thank you so much. I’m completely ignorant about this stuff and found the article fascinating. One of my favorite knives is a Spyderco with CPM-M4 steel so I found it especially interesting learning more about it. Again, thank you very much! Thank you. So succinct and well-written. Would CLR products advertised for firearms (Froglube et al) be effective, practical on these knives? CLR would works just as well as WD-40 or any other penetrating and protecting oil. I usually use Froglube to lubricate the internal parts of folders like pivots, ball detents, and roller bearings. Froglube Rocks! I use it on the moving parts of my fly tying vise , my folding knives, and all of my firearms. I am hoping RF will let me do a formal review of Froglube at TTAG some day. Unless your knife has some cheap paint finish, any CLP will do. Froglube is a great one if you plan on doing any food prep with it. Will, I notice on your chef’s knife pictured below you have decided on a full bolster instead of a “Cordon Bleu” style with a full length edge (which is my preference). Is this just a stylistic choice or do you find it has other advantages? I can do either. In this case the customer has a certain style of chopping that had her hand choked up on the blade with the terminating edge contacting her knuckles. It was requested that the edge have a “safety zone” located there. This particular knife was also unique in the fact that it was hollow ground on very thin stock. Most of my customers request thicker stock and full flat grinds. Any information on EN-31 steel? This past Christmas I purcharsed a Emmersson “Horseman” folder for each of our boys then one for myself. When I took them into get names engraved it surprised me to learn the blades were tungston? I have since been informed to keep a edge on tungston you need a stone with diamonds embedded. I ask Emmerson if they could reccommend something but have gotten no response? So if anyone has any knowledge on this subject any and all input would be helpful? Many of the “affordable” Emerson knives are made of 154CM. If you got the black option, the knife is coated in a 1-3 micron thick tungsten containing composite: W-DLC, Cerakote, WC PVD, etc. This is a pain to etch with an engraving tool, but the edge itself will be of the underlying stainless steel. A high quality sharpener should work just fine. DMT makes good diamond sharpening stones, but a white crock stick (Alumina) will be alright too. Hey William nice input so 3v is stronger then zdp-189 right? I guess that the CPM M4 and the M390 are among the exotic alloys ? my question is when you say difficult to maintain (in terms of sharpness ) does it mean that you can’t do so with something like a Smith’s pocket sharpener? What is a good place to find reasonably priced cpm metals in a variety of sizes? William – thanks for a great article. I like how you explained the Alphabet Soup of steels – grouped by attribute and identifying the leading steels in each group. Hey im looking to get a knife made and id like to know can you use rex 121 for sanmai3 blades? Id like to do damasteel outer with a rex 121 or a M4 inner is this possible? Realize this is an old thread, but maybe you still respond? I’m trying to decide between CPM 3V and CPM 154 if you could briefly list pros & cons in regard to keeping an edge and rust. I do treat all of my blades with Tuf-Glide. This is for a folding carry knife that will be a back-up to a fixed blade on outdoor excursions. Very well written info on knife steel qualities and performance for said duty bought for. This is a very good baseline start for me. So yes I would love to read more of your comments, suggestions, KNOWLEDGE ABOUT THE DIFFERENT HIGHER END ALLOYS OUT THERE. IE—- Anything above AUS-8 as the very very bottom I would consider using or wanting in a knife blade for EDC. I own many knives, but I only consider a very few worth carrying. I own a knife in ATS-34 but making that ATS-34 better for its purpose is the treater. The Boss. Then I have S30V,, VG-10,, then one of my favorite Sandavic 14c28vn the primary top steel for Kershaw knives. At least the better ones. Then the Kershaw ones that are made in that steel but are laminated with a more exotic at the bottom are very interesting. So yes let the knowledge flow. Very intersting and easy reading and I appreciate your effort on this very much. Thanks for the info very helpful! I have to say and I am not a knife expert by any means but my personal experience with the benchmade griptillian with 154 cm blade steel has been a great edc knife. Corrosion resistant, holds a great edge after cutting boxes, and all around good feel to it for around 100 bucks. Best pocket folder I have ever owned! After many years of owning every brand of knife you can think of….Busse is baddass. Its costly but worth it.INFI steel must be from another planet. D2 by the way is tough…but almost impossible to get it sharp. New folks..can’t go wrong with cold steel…k-bar..Becker…spyderco. My 2 cents worth…maybe 3. I have a Benchmade 62 with D2 steel, I can confirm that it truly is a nightmare to sharpen. Now, I didn’t have to actually sharpen it for almost a year after getting it but when I did it took me nearly 6 hours with my Lansky sharpener to get it back to razor sharpness. I had a few extremely small chips that took so freaking long to grind out. Now I just carry a Boker Plus Nomad in 440C for when I need to abuse my knives and not get pissed about wrecking a $35 blade. What about all this stuff claiming to be D2 steel were seeing on eBay? Any chance it could be the same steel used to make their Damascus? Where is it coming from? The sellers advertise everything from an RC of 58-62. But who has the tools to confirm it? I have a 1095 sword I just got on eBay and it has a hair line crack in it. Is there a way I could maybe melt a nickel in the gap or ‘re forge it somehow it that spot and make it strong. what steel would be a good bond to carbon steel and how hot would it have to get before I try hammering it out. Naw, man. Just sand down the rest of the area to the same depth as the crack, then re-etch the blade with apple cider vinegar. Pre-cut some cotton into a pattern that will exactly cover the area, and then soak it with ACV. Then lay it on the blade, lay some thick plastic on it and put a small weight. I use a pocket sharpening stone. Periodically resoak the ACV. This is how I am doing my knives. I am still in the finishing process and this is one of the steps. Maybe there is a better way, but this is the first thing that occured to me, when I realized I haven’t got the space to dip it in muriatic acid, and I have no ferric chloride. I wish I had some scotchbrite. I just made my first two knives out of Ebay Damascus steel. 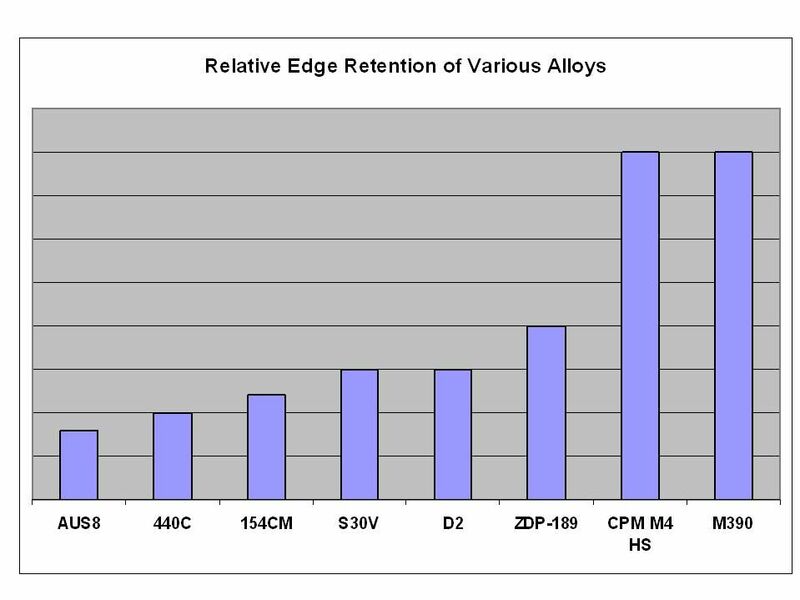 The edge is by no means a super steel, compared to CPM S30V or CTS XHP. While I can say nothing against toughness, it loses its hair shaving edge quickly. While not the sharpest steel, it it cuts well and has a toothy edge. And it’s beautiful. What’s not to love? Mind you the blanks I used came in pretty ragged and unusable condition until I seriously reshaped them. For your average user, steel choice matters little as long as they get something with quality steel and heat treat. Most will never use their knife in a capacity to warrant much further investigation. I’ve never had a problem with 1095 unless I’m working in a environment where it is constantly exposed to moisture. Best thing about it? It is one of the easiest steels to sharpen. A large portion of the modern super steels almost require a high end setup like the EP Apex or a trip to get professionally sharpened. what do you know about aogami super blue steel? would it be better than getting ZDP189? (corrosion isnt an issue for me) if you could help me out itd be greatly appreciated. does any person actually have first hand experiance of a pakistani knife blade breaking? I have seen tons of Pakistan knives, mostly crappy bowies, that aren’t going to break because they’ll bend right over 90°! They are lowest quality stainless with no heat treatment, far as I’ve seen. One whack on a hard piece of wood and the edge is rolled. On the topic of good steel, I look at it like this, there are good old school high carbons, new school powders, good stainless, and then there’s D2, I love D2 and there might be other steel that do one or another thing better but I am prone to a nostalgia that makes fancy powders something too technical for my liking. I also dont mind patina but dont want a rust magnet, dont want to see my own ugly mug when I look at a blade, and will take 2 hours sharpening once a month over a half hour every week. I think the steel has a right to make me work for it and if I do it has an obligation to hold it. If I’m talking about edc folder, stainless is a necessity unless its got a good coating, but I’d still prefer a larger blade that can pry if it has to and D2 HTd properly will hold up better then stainless’s above its price point. The heat treat is so important that a lot of people write off D2 as too brittle because its has lots of carbon it needs to be set up right or it will be. Someday the PM craze will level off and there will be a handful that stick around as tried and true, in the mean time I will keep being very happy with steels that have already run their laps. Good knives and blade tools from the turn of the century with good steel are exactly that, a century old, and a razor sharpenable axe, bowie, bayonet or chopper from 1910 with not a single chip or lost tip says a lot about simpler steels and diminishing returns. 1095 is great steel for all around use. I’ve never seen a broken Ka-bar. If the heat treatment is right, this steel is an amazing steel at a very low price. Ka-bar uses 1095VN which is slightly updated version of regular 1095. Ka-bar and Becker knives are the best deal out there. the supersteels are better all around steels but is the cost really worth it. is it worth to pay 4x the price to get near the same performance? the only difference between s35vn and 1095 is rust resistance. But even stainless steel will rust. Just far less. I can buy 3 knives made out of regular steel or I can buy 1 knife made of supersteel. I would rather have 3 knives that way I will always have a knife when I need it. the knife market just like the car market is always changing. new knives come out every year just like cars. the new cars that came out this year are not better than the cars that came out 10 years ago. What you’re paying for is different (not necessarily better) styling and all electronic/automatic bells and whistles inside it which some of us don’t want nor need. Please notify me of M-390. But staying in line with topic at hand about is what your looking for “scratching head”,, I think the changes in performance of 1095, different H-T’s, coatings or such to make it more corrision resistance would be interesting reading material. In the past I’ve bought a custom small bushcrafter, 1095 done right was his claim. Hard as a highly compressed bit of coal I’ve many years. Not really but had to compare it to something. Had not used it very much but wanted to see how the steep scandi grind would act on flat solid plate diamond impregnated steel. IE flat diamond stone. I gave up trying to do a thing in sharpening, changing bevel, etc, etc. So there it is. My next folder I am looking at a high flat ground blade in M-390. Read from one of the top experts that, that is his steel of choice he now uses. Also claims the finish can enhance the performance oy the steel. Like doing procedures to as much as possible to close the pores of the steel as much as possible. Claims M-390 is comparable to S30V on steroids. By the descriptions I have given my 1095 you would not have a clue to the custom maker. But knife arrived at my home with slag all over it, very bumpy blade after I ran it through my bench grinders wire wheel, not very sharp at all. I suppose that “maybe”at a hundred bucks from a custom maker may have been a good deal. What say you??? What make 1095 CroVan such a good knife steel? I found this discussion when I was trying to figure out what I was doing wrong trying to sharpen a Chipaway knife made in Pakistan…. I have the DMT bench set of diamond sharpeners that my father gave me when I was in Scouts. I also have trouble sharpening some of my Buck knives, however all of my other knifes sharpen razor sharp… Kershaw, Gerber, KaBar, Schrade, Case and Buck lock blades all sharpen very well… Should I use an Arkansas wet stone on 440? I purchased a Kershaw knife with Damascus stell Blade it really stays sharp. I watch what I cut with it because it was so much higher than the other ones. But its really nice and inexpensive about 80.00 bocks. Does Kershaw sell quality Damascus blades ? Thank you for Web Site James c.
First of all, grear information, enjoyed reading. Re: 1095 steel, so far not a lot of knife enthusiasts mentioned it. Am I just old fashioned or should I adopt a more modern opinion. I just really like my 1095 steel full tang fixed blade knife, but having a hard time finding a good folder in 1095. Hi William: Thanks for the great info. I am new to EDC folding knives. I purchased a Spyderco Tenacious from Blade Hq about a year ago, and use it every day at work, its not perfect but has done very well. I also purchased a couple of Chinese clones online ,which also claim to be 8Cr13Mov.The knives have been Ok, but I am suspicious ,if the metal really is 8 Cr 13 Mov,or whatever the claim happens to be on any given blade. Is my suspicion unjust? I would now like to buy a couple of higher quality knives, one folder and one fixed blade. What would you recommend. Thanks. Super steels are like super duty trucks. Everyone I know who has a super duty don’t own a 5th wheel trailer or boat. They don’t tow anything. The truck never leaves the pavement but all you hear from them is I got this torque, I can tow that much while hauling this much, I dont have to get out in mud to to lock the hubs and the tires are $700.00 a piece off-road masters. They never leave pavement and never haul more than groceries. People (most) who own “super” steel knives are even worse. No reason to own a knife but they’ll tell you how much better it is than the buck 110 you use every day. Online is even worse. Super steels are a gimmick no one who actually uses a knife needs. It’s like comparing baseball cards for the collectors. Who ever spends the most can buy the most expensive blade and to them that’s all that matters. In the past 20 years there has been an absolute conspiracy to keep modern EDCs in steels that are just agony to sharpen. By “Modern EDC” I mean, lightweight/pocket clip/1-handed/single-blade. Until recently not ONE modern EDC was made in an old-school steel such as Stockman’s or Sodbusters came in. No longer could you bring your blade back to a hair popping edge in a few seconds on a pocket stone: you had to consult the great ARTIST. You had to resort to Benchmade’s “Life Sharpening Service”…. Next you’ll be served expresso and finger sandwiches while you are waiting to speak with your knife counselor…. If you’re in the woods and your S110V goes dull just go up to a mail box–they’re on every tree–and in less than 2 weeks you’ll have your blade back. The SALVATION: Recently, the Spyderco Chicago (440C), the Spyderco Cat G-10 (BD1), and the Boker Nano (440C) have all come out in steels that can be sharpened without a computerized belt system. Also Ganzo (440C) makes extremely underpriced knives which are far closer in quality to BM/Spyderco/ZT than in price and just a joy to sharpen. The dam has finally bust and MEN who sharpen their OWN blades will be able to carry an EDC with a pocket clip. No thanks to Benchmade/Spyderco/ZT/Chris Reeve/etc, etc. and all their S30v/VG-10/154CM/S110v unsharpenable masterpieces. You must just have the caveman approach and use a concrete block to sharpen you knives… I have no issue sharpening these steels and keeping them sharp with a simple strop on the ol strop block every now and then. If you go out in the woods with a sharp s110v and you end up with a dull one then you may need to make sure you actually have an s110v blade. Maybe you should get a good set of stones and practice and you will one day be able to whittle hair with these “super steels”. Btw you consider VG10 a super steel??? The post was written in 2013. The bar has been raised since then. I don’t know if you still read comments here, but I don’t want to buy a knife out of VG10 steel, I want to buy the steel but can’t find it anywhere, do you know where it can be sourced in the United States? I want to have a Schrade number 805 type folding pocket knife custom made using CPM S110v stainless steel blades with laser etching on the blades and am having trouble finding anyone who can do this. I would appreciate it if you could make a couple suggestions as to who I might contact in this regards. I would pay between $300 and $500 per knife if possible. I need several of them. ps: I couldn’t find your name in the “Knives 2017” catalog which surprised me. Is it possible to hardened my folding pocket knife?? Heat it up with a cutting touch them dip in oil. What kinda oil should I use? Wow, the amount of psychological sales techniques in this article is very impressive. The “we were all 11 once” can cut both ways. Buying Air Jordans basketball shoes will not make you play like Jordan, and expensive steel knives will not make you more likeable. Great steel is much more expensive than average steel, but the prices put on production knives is ridiculous. For many they are used as glorified fidget spinners, which happen to flick open versus spin. I do not begrudge people spending their money as they see fit. But I do not like the guilt trip and demeaning language used to describe all other lesser steels that are still very good steels. Most knife buyers in my opinion do not need the steels they spend their money on. They want to belong to a fictitious club of knife/tacticool people who are better and more discerning than the average proletarian swine. And you probably don’t need anything more than a 1988 Honda Civic to drive. I mean it gets you from point A to point B and that’s the ONLY thing that counts in a car, right? No one needs a 350hp car, or a car that rides nicely, or has an interior that feels good to the touch. It’s only a tool for transportation and everyone should know their place and drive the minimally acceptable vehicle for their direct needs. It is funny. If I buy a production knife, it is usually something with above average steel or a sweet dollar for dollar deal on something lesser. For the custom Sgain Dubh I have commissioned Will to make is going to be in 154CM. High quality cutlery steel for sure but nothing swagger worthy. And I am perfectly fine with this. The custom knife supplied the swagger. There are so many variables in knives that determining the value of steels can be difficult. There’s the grind, thickness of the blade, angle, heat treat and hardness, just to name a few. Many blades are advertised as 440A stainless steel, but their heat treat is dreadful. I learned a long time ago that Cold Steel, by employing decent heat treat, can make 440A and AUS8A sing. Other knife companies pound the steel into the shape they want and don’t care about the quality. Their 440A is junk and their AUS8 can be soft. Thus, comparing them is a losing proposition. I’ve never understood why one can’t buy a TiNi-coated 1095 carbon steel folder. It would outperform just about any supersteel available and it wouldn’t rust. My daily folder is a Spyderco in ZDP-189. I tried CPM 440V several years ago; too hard to sharpen. My experience with D2 is that it’s wicked sharp in small blades, but somewhat brittle (tip breakage issues). I don’t know how it works in fixed blades. I have fixed blades in (MerkWorx) S30V, and (Cold Steel) in San Mai III. It seems to me that heat treatment is the hidden variable here. How much does this affect a typical knife steel like S3V? I am new in the knife world as far as buying and selling. I’ve been fascinated with all types of weapons as many boys are growing up watching Rambo and Crocodile Dundee and recently I had an idea to buy and sell knives as a business. After some quick research there was no way I could purchase from a U.S. manufacturer and make a profit and certainly would not be able to spend years learning and then investing in everything that goes into blade making and end up any where but bankrupt. So my conclusion was I would have to find a company to import from at a lower cost. I’ve heard people bash China, Pakistan, Indonesia,etc for making fake copies of real knives that are completely sub par in quality, but after looking at my own collection of what I believe to be at least of a medium quality I discovered most of my knives are made in China using 440c. This list of knives included S.O.G., BUCK, AND even K-BAR just to name a few so I figured there had to be a catch. I have been searching for about six months for a distributor that can first of all make a knife that is to the eye symmetrical, accurate to the pictures displayed, obviously has good reviews and follows common sense ethics and produces a knife that performs as well as it looks. It has taken me about ten manufacturers from several different countries buying samples to finally find one which landed me to a maker in Pakistan. He is 3rd generation blade maker and his knives are absolutely stunning and when held are the nicest feeling knives I’ve ever touched. Again I’m new in this world but They make any S.O.G, Buck, Gerber, I’ve ever held seem cheap and from different worlds. The only other knife I’ve owned that compares is a Japanese Bowie knife made by Black Jack called the Anaconda. There’s knives sell for$300 plus on eBay consistently. As with the Anaconda Every detail seems to be to near perfection and the design of these knives is totally incomparable to any I’ve bought at an American retail store. The blades, even the smaller Skinner style knives ,have a spine no less than 3mm thick. Most are full Tang and can be made to any spec needed. The price per knife is right on the money, as long as you buy in fairly high quantity, to make an excellent profit. The cost of a S.O.G of comparable types, could buy me 3 of this manufacturers blades. My business is just in the starting phases and haven’t even begun to sell yet but Having said all bthis I want to build this company into a respectable company that when you see my logo you know you are getting a blade that meets the standard of a knife that is worth every penny you pay and just because it says made in Pakistan doesn’t immediately discount the quality of the knife. I’m a law abiding man so every blade imported into the U.S. has to be stamped it’s country of origin. My fear is that all the negative publicity on the web will deter people from buying a knife made in Pakistan even though I believe them to be built in the category of high end knives deserving much respect. I have been studying all the different types of steel used in forging blades including the modern”Damascus”blade to 1095hc blades and all the other steels in between. My manufacturer has been schooling me in all the processes taken from start to finish to fabricate his knives using different types of steel and his processes. I’ve done research on every thing he has told me and all his info seems to arguably be the best way to create these blades with the many different types of steels and applications that they will be used for as well as the aesthetics of the knives using all natural materials to the of tempering blades leaving beautiful hamon lines that are beautiful and practical. Being a newbie to all of this I’m planning a trip to Pakistan to veiw the facility and verify all the materials and processes explained to me so that I can be confident in my marketing and selling of these blades. Anything new on Cowry-x steel? Is it still being made? I notice only 2 knife-makers using it, and in extremely limited numbers (Hattori in Japan, and only one particular knife by Falkniven). W. woods great job on explaining knife metals. Right on. Hello Mr.Woods,I like the “101”about the difference in steels,knives,quality,I learned a lot from it,you wouldn’t happen to have your own line of knives would you,if so Please feel free and send me that web page,I’d appreciate that sir.Thank you for your time. I believe this web site has very excellent written content content.